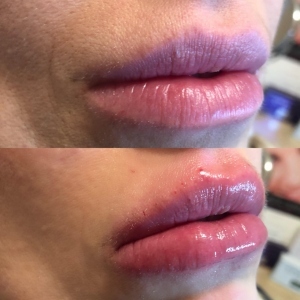 Injectable Dermal Fillers are used to restore volume and create contours on the face where they are needed or where the volume has disappeared with age. Dermal Fillers are most frequently injected into the lips, cheeks, temples, forehead, hollows under the eyes, and in the nasolabial folds. Dermal fillers also can be used to reshape the chin and sharpen jawline. The most commonly used products such as Juvederm, Revanesse, Stylage, Restylane are Hyaluronic Acid (HA) base. Hyaluronic Acids are sugars that are naturally produced by our bodies and found in connective tissue, cartilage, and some nerve tissues so they are a completely natural product to inject into your tissue. HA products are temporary, non-surgical and can result in a younger, refreshed, and revitalized appearance. Results are individual and last 8 to 16 months.